SSL Certificates in Exchange are widely used, both for encryption of traffic as well as server authentication. Despite the fact they are widely used, a lot of admins still think certificate management is difficult (and expensive). But it is not, let me explain. 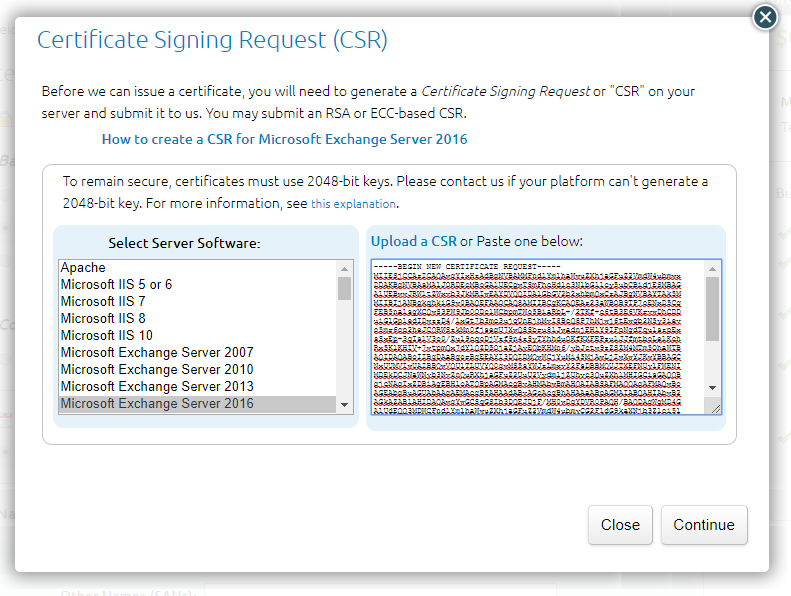 During installation of an Exchange server a self-signed certificate is created. This self-signed certificate contains the NetBIOS name of the Exchange server (for example, AMS-EXCH01) and the FQDN of the Exchange Server (for example, AMS-EXCH01.labs.local). A self-signed certificate can be used for HTTPS troubleshooting purposes. It can encrypt the traffic between the client and the server, but when it comes to server authentication it will fail since the issuer of the certificate is not trusted by the client. You can work around this for internal clients, but for external clients this is not possible, let alone when configuring an Office 365 hybrid environment. For SMTP it is a bit different since server authentication is only used when configuring forced TLS between different domains or between Exchange on-premises and Exchange Online. For daily use, a self-signed certificate can be used safely by SMTP, and TLS using the self-signed certificate is referred to as opportunistic TLS. For HTTPS traffic a 3rd party SSL certificate must be used. There are several vendors in this market offering great SSL certificates, but personally I have very good experiences with Digicert certificates, so my blogpost is based on Digicert. contoso.com – Used by regular client traffic like OWA, Mapi/Http, ActiveSync and Exchange Web Services. contoso.com – Used by Outlook clients to retrieve configuration information from the Exchange server when creating or configuring an Outlook profile. The Autodiscover namespace is used by default by all Outlook clients when not connected to an internal Active Directory where the Exchange servers reside. Creating a request file for the new SSL certificate. Submitting the request at the vendor. Importing the new SSL certificate issued by the vendor on your Exchange server. Exporting the SSL certificate for offline store (optional). The first command creates a new variable called $RequestData where SSL certificate information is stored in, the second command stores the contents to a file on the local hard disk. You can open the request file using notepad, but although it is clear text it is unreadable and does not make a lot of sense. Submitting the Request with the Vendor. After you’ve completed the order you must wait until the order gets approved, your request is validated and then the certificate can be issued. Timing depends a bit on your vendor and the type of certificate you have ordered, but I’ve seen certificates issued in 15 minutes, but also in three days. The first command reads the contents of the new certificate in a variable called $Data, the second command imports the certificate into the server’s certificate store. Please note that no password is needed at this point. You are now ready to go. If you feel comfortable you can always execute the IISRESET command, but that’s not needed. Once you have the certificate in place it’s a good idea to export it to a backup file (.PFX) and store it in a safe place, just in case you lose your Exchange server or when you want to import it into other Exchange servers or into your load balancer. After importing the certificate, don’t forget to bind it to the services you want to it. SSL Certificates in Exchange are used for server authentication and encrypting traffic. By default, each Exchange server get a self-signed certificate during installation, but for clients you need a proper 3rd party SSL certificate.